Important introductory note: before watching the video we suggest reading the article that supplies all necessary information to a better understanding of the video. The study published in “The Lancet" and the allegations of Brian Deer. The development of those children was normal for a number of months after which there was a loss of acquired abilities - among them were interaction with the rest of the world and speaking abilities – together with serious abdominal problems (acute pains and diarrhoea) lasting many months. For 8 of the 12 children the result of the study related the abdominal symptoms to a recent MMR vaccination2 (anti- parotitis-measles-rubella), for one of them with a measles infection and for another with acute otitis media. The paper concludes saying that a link between MMR vaccine and the described symptoms has not been found as the data are not sufficient to draw such a conclusion and further studies are needed in order to verify a possible relation with the vaccine. Interviewed on the matter, Wakefield stated that instead of carrying out the combined three it would be advisable to carry out single vaccinations only with some time between them until it had not been possible to undertake more aimed studies. Because of the notoriety of this study, although it was not suggesting a clear link between vaccinations and autism, was so wide in England, during the next few years the number of carried out MMR vaccinations was scaled down for the fear of possible adverse reactions. 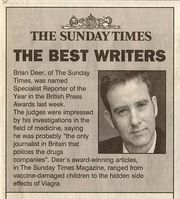 Later on, Brian Deer3, a journalist with no medical qualification initially appearing to work independently, was interested in the matter and wrote a few articles4 published by the Sunday Times in which Wakefield was violently attacked, accusing him at first of having carried out the study without the parents’ consent and therefore "not ethically". Later on, in other5 articles6, he also stated that Wakefield had intentionally counterfeited the patients’ clinical files in order to obtain the wanted results aimed to develop on his own a lucrative alternative vaccine.